The Ruger SR22 in .22 caliber was introduced to the market in 2012, and was really designed to target the .22 caliber plinking and target shooting market. Although the SR22 is associated with the Ruger SR centerfire series, from a design standpoint, it’s completely different from the SR centerfire models. The SR22 is built around a straight blowback design that uses a polymer frame (like the SR9 and SR40 series) mated to aluminum slide. The pistol features a stainless steel barrel and uses a DA/SA trigger system, with an external hammer. Operationally, the SR22 uses an ambi safety/decocking lever, and ambi magazine release. The DA/SA action means that the SR22 can be fired in either DA (double action) or SA (single action). The decocking lever allows the hammer to be safely lowered on a loaded round. #1 – Standard SR-22 – This version has a 3.5” barrel is available in a number of different frame color and/or slide color configurations (Currently there are 8 different versions of the standard SR22). #2 – SR22 Target – The so called “Target” model (Ruger model #3620) features a longer 4.5 inch barrel (as opposed to the 3.5” version found on the standard SR22 models). #3 – SR22 Threaded – This version (Ruger model 3604) features a standard 3.5” barrel that is threaded for a suppressor. The SR22 models offered today come with 2 interchangeable grip options with a “slim” or “wide” palm swell grip. #1 – I read in a forum that the SR22 was basically the same size as the Walther P22 and would also fit into a holster made for the Walther P22? Is this true? 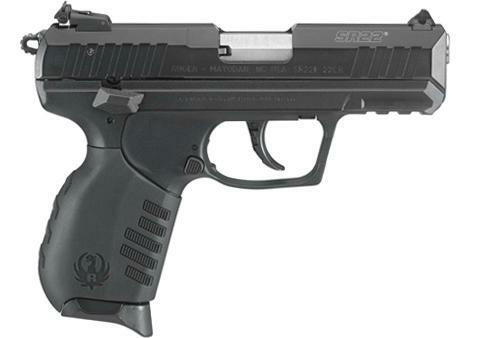 While the Ruger SR22 and the Walther P22 do look similar, they have very different dimensions. As such, the SR22 won’t fit (at least not correctly) into a holster made for the Walther P22. #2 – I have the Ruger 3620 model SR22 with the longer 4.5” barrel. Do you offer any holsters to fit it? Yes, we do. Any holster listed below is available in a version to fit the Ruger SR22 4.5” barrel version. #3 – I see holsters for the SR22, but do you offer any magazine carriers? Yes. Any magazine carrier made by MTR Custom is available to fit the SR22, and those can be seen here: magazine carriers. #4 – I’m looking for a security holster for my SR22 3.5” model. Do you have anything that will work? Most any holster listed below is available with an optional thumb break (retention strap) that can be added to the holster. #5 – I see you carry Don Hume holsters, but don’t see any Don Hume holster models listed below for the SR22? Why is that? Unfortunately, at this time, Don Hume isn’t offering any holsters to fit the Ruger SR22 model. Any holster model listed below is available in a model to fit the Ruger SR22 with a 3.5” or 4.5” barrel.